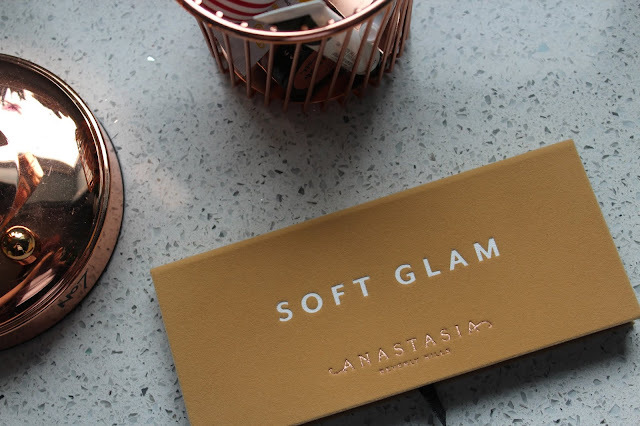 Anastasia Soft glam - Review, shade breakdown and swatches. 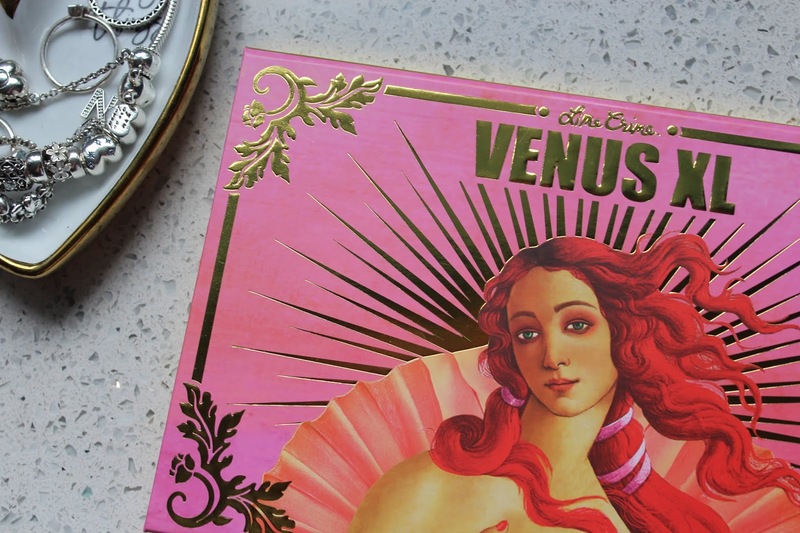 I figured it was about time I reviewed this palette. I have been obsessed with this palette recently and pretty much using it on a daily basis. 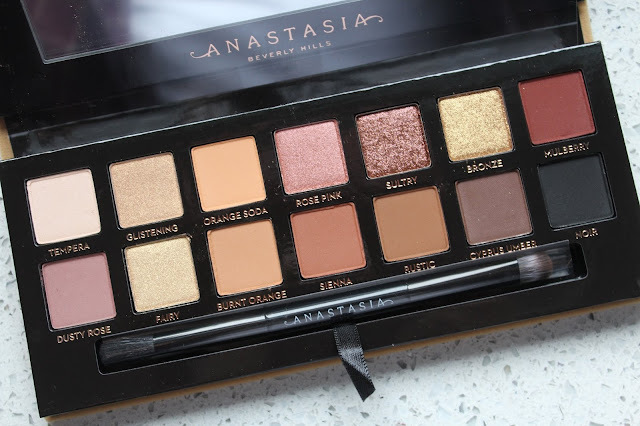 I feel like this is the first proper neutral palette from Anastasia which I was incredibly excited about, I feel like a lot of people wanted something different but I just think everyone needs a good basic neutral palette. 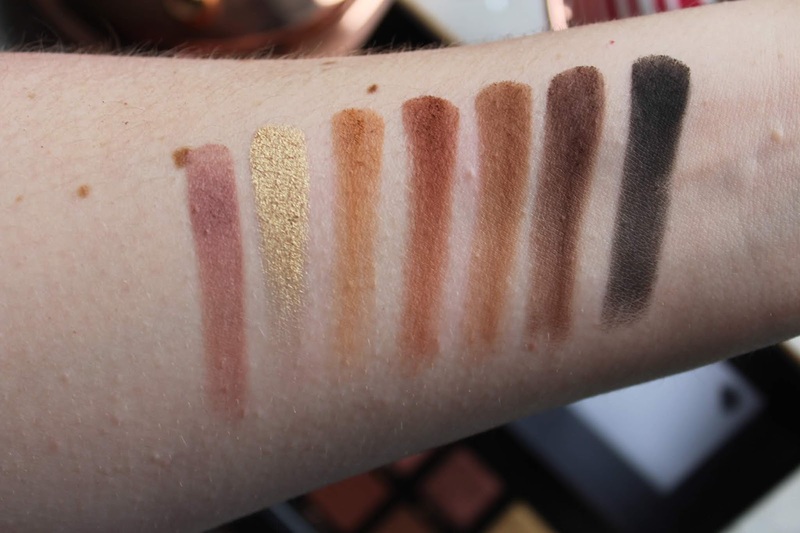 I love a good shimmer shade as much as the next person however I do like a palette with more mattes than shimmer shades so the mix of eight mattes to four shimmers is a brilliant one for me. The shimmers are incredibly pigmented and have an almost foiled effect to them. As with the modern renaissance the matte shades are so stunning, blending like a dream. 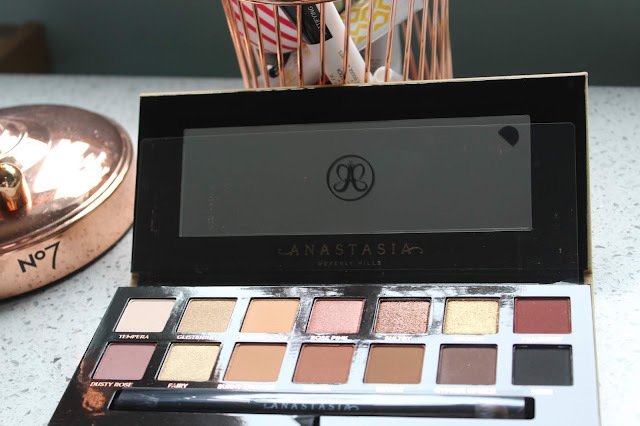 I feel like this palette is so versatile, you can go for a super smokey look, stick with something natural or go super glam and do a metallic on the lid. So onto the shades. Tempera - A. very slightly satin cream shade perfect for brow bone and inner corner. Glistening - The first of the three gold shades in the palette. This one is much more like a normal shimmer shade than some of the others in the palette, but never the less it is still beautiful. Orange soda - For me this shade is the perfect transition shade as its a couple of shades darker than my natural skin tone. Rose pink - This is the first of the three more metallic shades. The name is incredibly fitting as it is simply a medium rose pink shade. This one is so beautifully metallic and one I reach for a lot. Sultry - A deeper bronzer metallic which looks so incredible on the lid when I do a super smokey eye with this palette. Bronze - Bronze is more of a gold shade. It is the deepest of all three golds in the palette and looks so incredible and metallic especially when used wet. Mulberry - A super deep matte burgundy shade. I wasn't sure how this would blend however it is so easy to blend and perfect for a super blown out reddy smokey eye. Dusty rose - This one is another great transition if you want something a little more purple in the crease. I love the addition of this shade into the palette as it offers a little bit more of a cool tone into the palette. Fairy - The third and final gold shade this is the lightest of the three and is more yellow toned than glistening which is more of a champagne. Burnt orange - If you have deeper skin this would make an amazing transition. If I blend it well enough it does work as a transition for me however I definitely prefer orange soda for my skin tone. 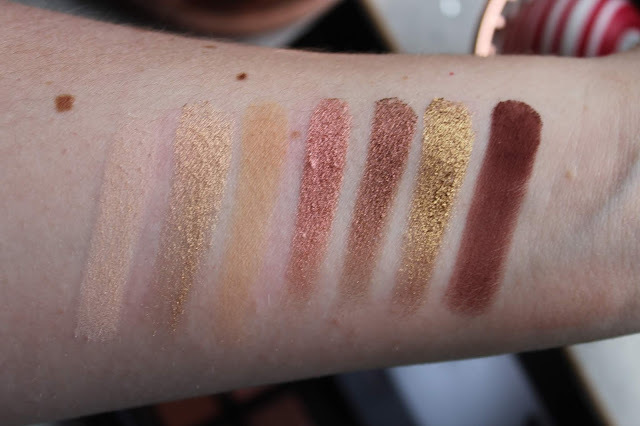 Sienna - This for me is the one I reach for to initial start to deepen my crease. It's a very red toned brown. It blends beautifully like all the other mattes and pairs really well with Mulberry. Rustic - I feel like this is a standard warm brown shade. It makes a great crease shade and is just a good basic shade to have in a palette. Cyprus umber - A deeper brown matte shade, I love to use this one to deepen up any looks. Noir - A pure black shade which I have to say is absolutely incredible. Its so deep and doesn't grey out when I blend it which is the main thing I want in a black shadow. So that's it for today, I'd love to know what you think about this palette! I am aware it hasn't been that long since I posted my March favourites however I did promise that I would put up a favourites post for every month this year and I don't want to break my promise. 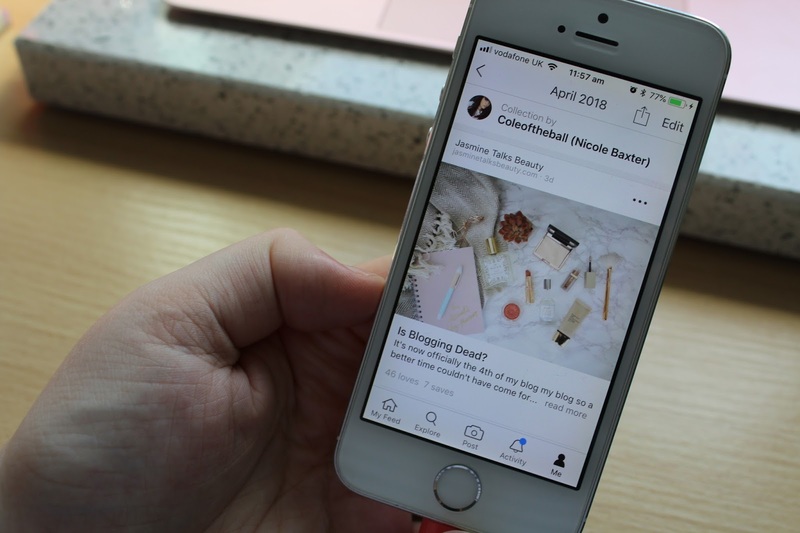 I've been loving a lot of skincare this month as I have been trying to get my skincare into a good routine. 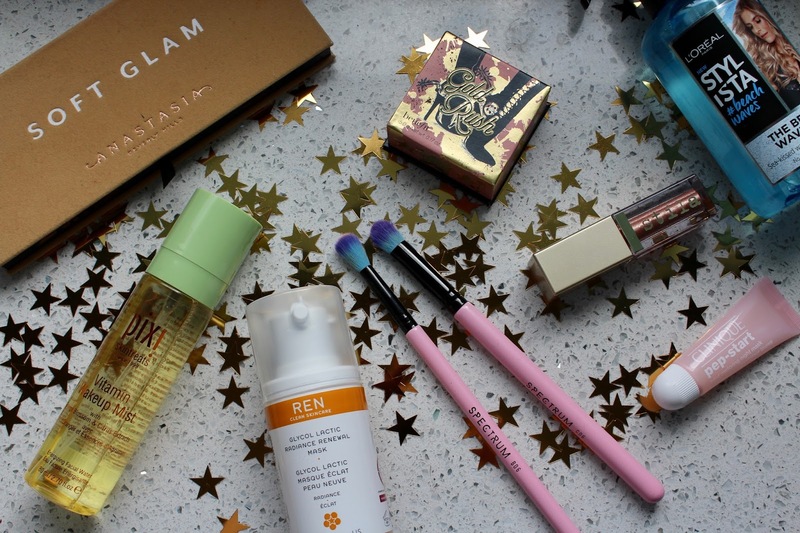 If you'd like to see my new skincare routine let me know as I can write a post. 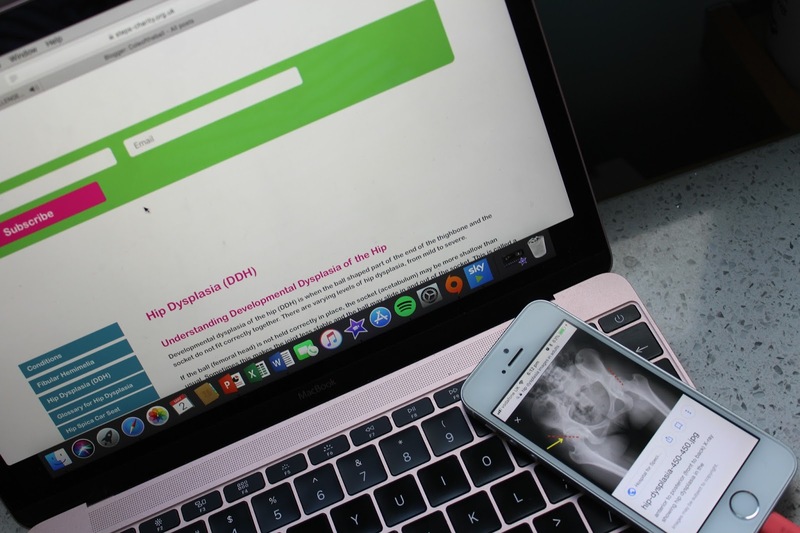 Since my diagnosis I have always felt resentment towards the GP who missed my condition when I was three years old. After watching the Buzzfeed series about chronic pain I decided that I wanted to write an open letter to the woman who changed my life forever. You guys always seem to really enjoy these posts. I love collecting these posts over the month and I am all about sharing the love for my fellow bloggers. I will pre-warn you this post is a little Erin and Jasmine heavy but I love them and their blogs so sorry ahaha! So without further ado lets get into this months roundup.